The possibility to create matter from vacuum has been one of the most exciting predictions of quantum electrodynamics. Schwinger in 1951 assumed that for creating spontaneously an electron-positron pair in vacuum, the field has to be strong enough to perform a work of an electron rest mass over a Compton wavelength. This became a definition of the critical field of quantum electrodynamics, below which the probability of creating electron-positron pairs becomes very small. In a field higher than the Schwinger critical field, a single electron or an energetic photon can seed a QED cascade, an avalanche of repeated pair creation that leads to a production of a very large number of particles. Unfortunately, this could not be tested in the lab so far, because the Schwinger critical field was (and still is) beyond reach of state-of-the-art laser technology. However, there is a way to observe QED cascades with near-future laser technology, even without reaching the Schwinger field. Lasers can accelerate electrons to relativistic energies, and the Lorentz-boosted fields the electrons perceive in their rest frame can be several orders of magnitude higher than in the laboratory. Using clever configurations to maximise this effect, it is possible to reach the Schwinger field in the electron rest frame. One such setup is shown here: a four-laser optical trap is used to create a QED cascade seeded by a small target. The figure shows a standing wave created by the four linearly polarised lasers arranged in two pairs of lasers counter-propagating with each other. One pair is moving in x, and the other in y direction. The loops on the picture represent the electric field structure of the standing wave in the region where all four lasers overlap. 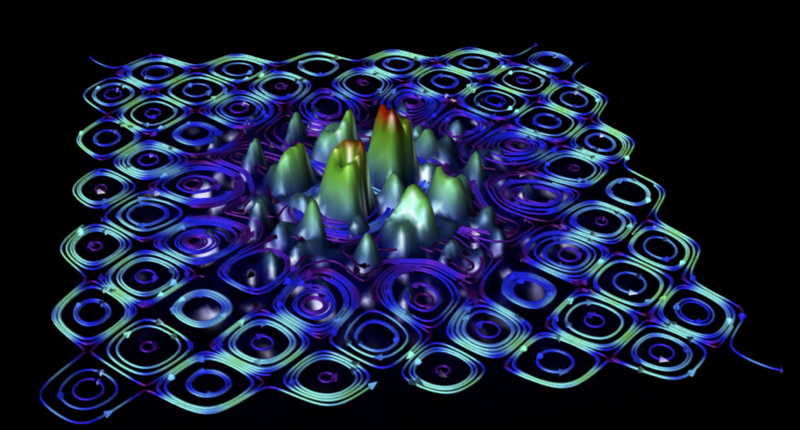 The surface shows the density of emerging plasma that is created by a QED cascade in the laser field. When the surface is above the level of the electric field vector plane, the plasma density is superior to the relativistic critical density, and the laser field structure is disturbed by the presence of such plasma. To reference this picture, use Vranic, M. et al., Multi-laser QED cascades, Bul. Am. Phys. Soc., 57th Annual Meeting of the APS DPP, 60, PO7.00001 (2015), manuscript in preparation.